Suzuki India has launched two new ATVs (All-Terrain Vehicles) in India at a starting price tag of Rs 5.45 lakhs (ex-showroom, Delhi). The Japanese manufacturer was the inventor of four wheeled ATVs in 1983. They are also credited to be the creators of the world’s first high performance ATV in 1985. The company with these two new ATVs (Ozark 250 and Quadsport Z400) is targeting Indian enthusiasts who want to lead an active lifestyle with focus on adventure sports. This nascent market in the country has been growing for the past few months ever since the entry of Polaris and Suzuki will be the first direct large-scale competitor against the brand which also owns Indian Motorcycles. The first of these, Ozark 250 is an interesting product with an automatic clutch. It claims to have class leading performance with low maintenance and stylish design. It gets a 246 cc 4 stroke air cooled SOHC mill mated with a 5 speed transmission. 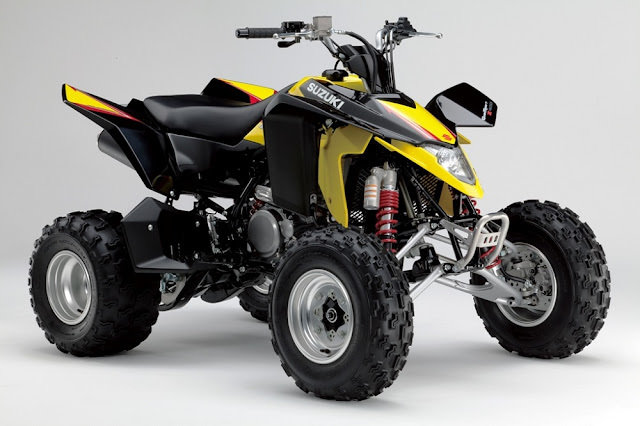 he Quadsport Z400 is a sporty high performance off roader with a strong chassis, torquey performance with smooth power output. Displacing 398 cc the single cylinder DOHC mill is liquid cooled and gets fuel injection. Suzuki further informs that these ATVs will be available in Delhi, Mumbai, Bangalore, Pune, Kolkata, Jodhpur and Hyderabad in the first phase through authorised dealerships.